Liquid Robotics announces the deployment of two Wave Gliders, autonomous ocean robots, to capture live ocean data close to where lava is flowing into the ocean from Hawaii’s Kilauea Volcano. By using this unmanned technology, scientists have the rare opportunity to study the effects of the lava entering the ocean, the plume it creates and the interactions of the lava and seawater directly from the surface of the ocean. Scientists note that very few volcanic eruptions and lava flows have ever been monitored in real time from the ocean. Over the next three weeks, the Wave Gliders will operate a precise zig zag course, approximately 300m+ from the lava flow plume collecting rare subsurface, surface and atmospheric data. Working with top researchers from the University of Hawai’i at Hilo, Massachusetts Institute of Technology (MIT), and the U.S. Geological Survey’s Hawaiian Volcano Observatory (USGS-HVO), the Wave Gliders host a wide assortment of sophisticated sensors to measure: water temperatures, oxygen levels, pH levels, salinity, turbidity, conductivity and underwater acoustics. The Wave Gliders will stay on station, continuously capturing sustained, high resolution measurements and imagery throughout the mission. By using an unmanned ocean robot vs. sending a research ship, researchers can collect scientific data on this rare volcanic event without risk to humans. This point was made upon arrival of the first Wave Glider at the lava flow location, surface water temperatures measured above 120F/49C. Conditions dangerous for humans, less so for ocean robots. Data collected by the Wave Gliders will also help scientists observe in real time the impact of volcanic eruptions and lava flows on marine life (coral reefs and fish populations) and air quality affecting the Hawaiian islands. As a Company with roots on Hawaii island and a dedication to care for the environment and Hawaii’s communities, understanding the quality of the lava haze (laze) generated by Kilauea is of great importance. 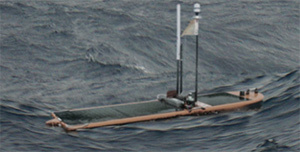 Liquid Robotics designs and manufactures the Wave Glider, the first wave and solar powered unmanned ocean robot. With our partners, we address many of the planet’s greatest challenges, by transforming how to assess, monitor, and protect the ocean. We solve critical problems for defense, commercial, and science customers. Visit www.liquid-robotics.com to learn more. Liquid Robotics and Wave Glider are registered trademarks of Liquid Robotics, Inc., a wholly owned subsidiary of The Boeing Company.